BEVERLY HILLS, March 15, (THEWILL) – In a bid to ensure the seamless distribution of fertilisers at an approved rate of N5,500 for 50kg, President Muhammadu Buhari has approved the payment of the outstanding N22bn that is meant for dealers of agricultural inputs, popularly referred to as agro-dealers. Addressing newsmen in Abuja on Wednesday, National Chairman, Agro-dealers Association of Nigeria, Mr. Kabiru Fara, said Buhari had to approve the payment of the balance of N22bn out of the N66bn that was owed the agro-dealers by the previous government. This comes as a part of measures to bring down the price of the commodity and enhance its distribution. Fara said, “The presidential initiative on fertiliser distribution is too important. We are happy with it because it will help the farmers get inputs at affordable prices and we are the ones who serve as a link between the farmer and the supplier. “However, our bankers and suppliers are not happy in dealing with us for now, because we have their money hanging, as well as some of our money that are still not paid. This liability was not incurred by the present administration, but we are happy that they have agreed to pay. We understand that Mr. President has approved expressly that the liability be paid. He stated that agro-dealers would use part of the money to make purchases as well as distribute the commodity, and urged the Federal Government to ensure the speedy release of the funds. Fara added, “We will use this payment to buy what fertiliser producers produce and distribute it across the market at N5,500. So, releasing our money will make the presidential initiative on fertiliser distribution easy. But without that payment, which we don’t know why, it will be difficult for some of our members to buy and distribute. The association’s chairman also urged the government to ensure that fertilisers were sold at the approved rate of N5,500 across the country by addressing issues of logistics. “Our recommendation is that the presidential initiative team should look at the issues of logistics and factor how fertilisers are to be delivered to centres where they are needed at N5,000 per bag. For they say agro-dealers’ money should be N500, but when you check the distances to transport the commodity, N500 won’t be enough in many instances. “So, we want the government to look at ways of getting the product to any location in Nigeria at a fixed price, whether at N5,000 or a little above that so that it can be sold at the approved price of N5,500 per bag,” he said. 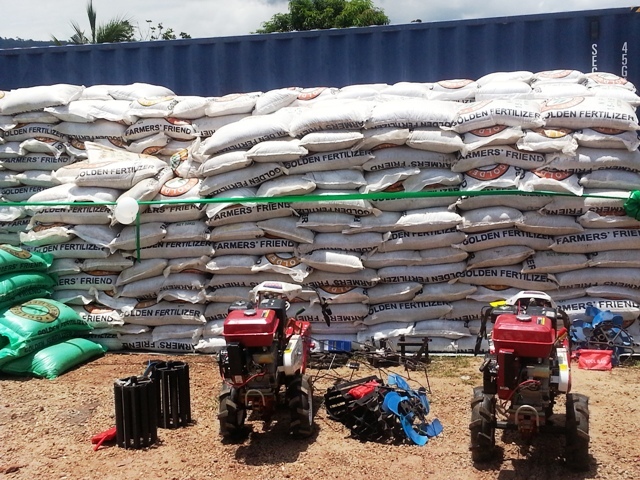 The Minister of Agriculture and Rural Development, Chief Audu Ogbeh, had earlier this year announced that the Federal Government was working out measures that would lead to the crash in the price of fertiliser by 50 per cent. Farmers across the country have often complained of the high cost of fertiliser, stating that a 50kg bag is currently being sold for N10,000 to N12,000, adding that accessing the commodity was also another serious challenge.